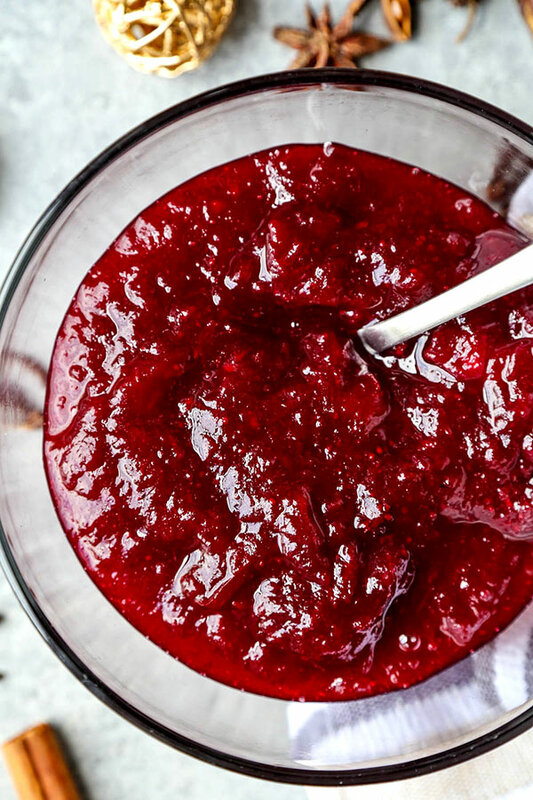 This Homemade Cranberry Relish Recipe is tart and sweet! 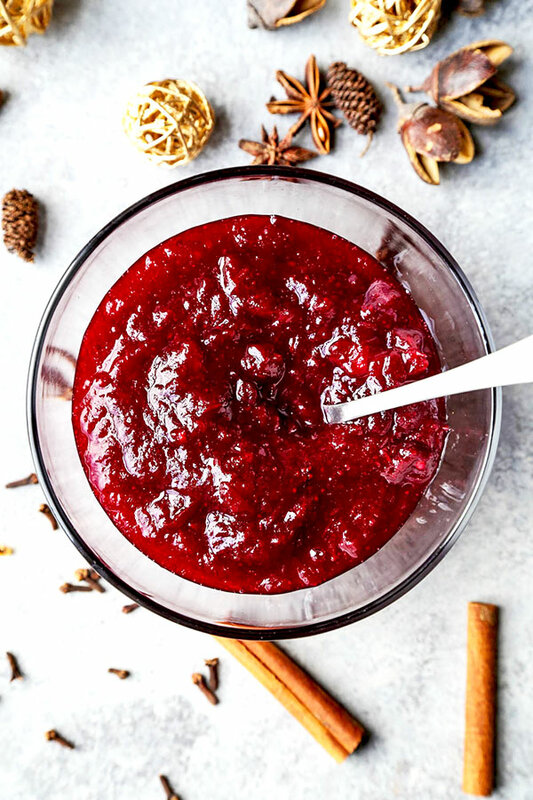 Healthier and prettier than store-bought cranberry sauce, this easy relish is ready in 20 minutes! I bet you’re already thinking about Thanksgiving. Hey, let’s hear it for the holidays! It’s one of those times of the year that calls out for the traditional foods we associate with family and friends and cozy winter feasts. But it’s also a time to experiment. It’s so much fun to find new uses for those traditional holiday ingredients. Hey – experimentation is how this super nutty chocolate bark was conceived! This year, I’ll also be serving a sweet and tart homemade orange and cranberry relish – which is a first for me! Not this year though! This year, I’m going all the way with cranberries! You see, aside from this tart, pucker-worthy homemade cranberry relish recipe, I’ll also be serving cranberry studded gluten free cornbread. 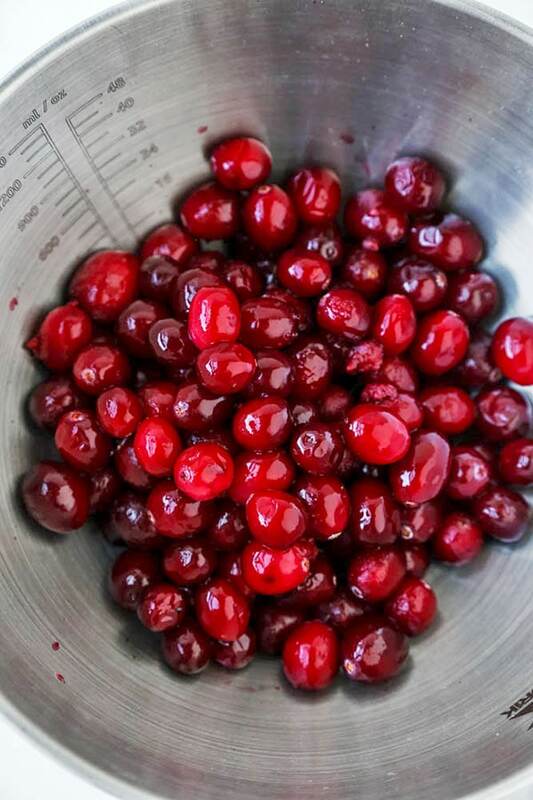 And you better believe there will be tart cranberries in the warming bourbon infused Kentucky Buck cocktails we’ll be passing around. It’s sure gonna be a festive holiday season with all the cranberries being consumed! So… Is Cranberry Relish the same as Cranberry Sauce? 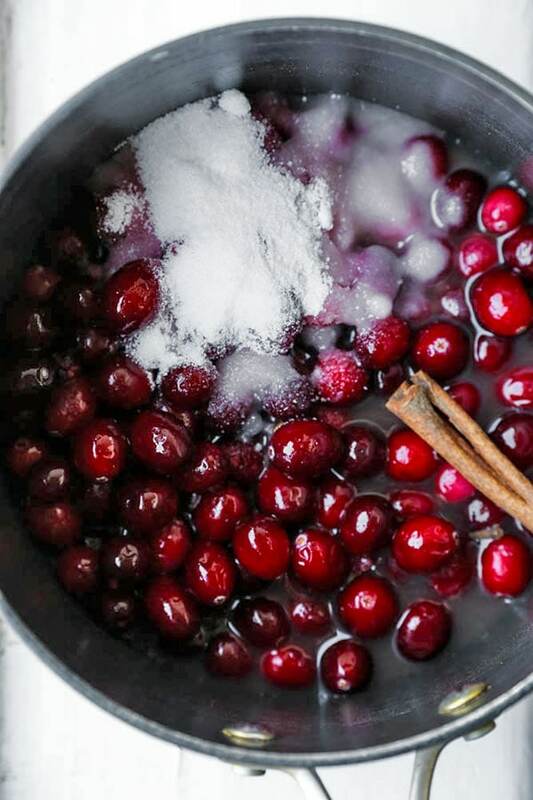 Cranberry sauce is usually a sweet mixture of cranberries, sugar and water. It’s then cooked for at least 30 minutes, until the cranberries are tender. Cranberry relish on the other hand is normally not cooked – and is on the tart side of the flavor spectrum. It’s made with cranberries, a little sugar – and some sort of citrus like orange or lemon. Spices and nuts can also be added. Everything is blended in a food processor and served as, well… a relish! 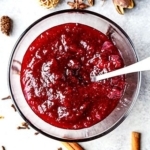 You see, it’s a mash-up of sorts – because it draws from both the cooking of a traditional cranberry sauce, but has the tart and cinnamon spiced flavor profile of a cranberry relish. My dish is simmered in a pan on the stovetop for 15 minutes (much like a homemade cranberry sauce). However, it’s on the tart side, as it’s cooked with citrus. And I added spices for a little punch of holiday flavor. Conclusion: homemade cranberry relish, y’all! Just like most of my recipes, I’m keeping this simple, quick, healthy and yummy. I’m using frozen cranberries because I usually can’t find fresh ones. I don’t think I’ve ever seen fresh cranberries in my neck of the woods – isn’t that crazy? 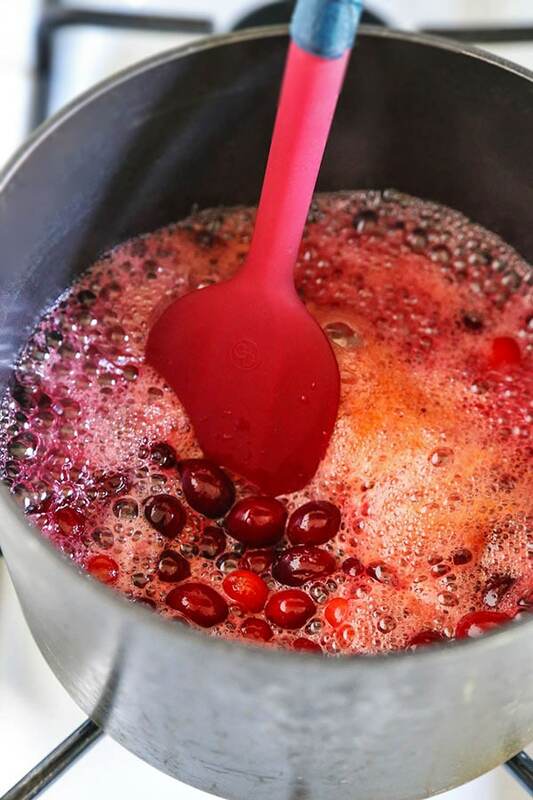 Now, if you do happen to have fresh cranberries at your disposal, you can definitely use those for this sweet and tart relish recipe. While most recipes call for about a cup of sugar, I’ve lowered mine to 3/4 of a cup. You see, I like my relish to be more tart than sweet. I then added some fresh lemon juice, orange juice, cloves and a cinnamon stick. Simply throw all the ingredients in a pot and bring to a boil. Once boiling, lower the heat and simmer with a lid on for 15 minutes. Then discard the cloves and cinnamon stick – and transfer half of the mixture into a blender and pulse a few times. Return the blended portion to the pot. This plays up with the textures a little, making the relish a little more interesting. Cool the mixture down – and that’s it. This cranberry relish is ready to be served! I added a cinnamon stick and a couple of cloves to the cranberry relish to give it more depth of flavor, and a real holiday charge. Well, I was a little hesitant at first. You see, I’m used to eating plain cranberry sauce and canned cranberry jelly. But wow! It was so worth it. The cinnamon added a beautifully sweet and aromatic flavor to the relish. Seriously… It took the tastiness to another level – a very merry level! This cranberry relish tastes like the holiday season – comforting, festive, spiced up and bright red. It goes well with everything, even with vanilla ice cream! Because making Thanksgiving dinner is elaborate and time consuming, you can prepare this relish a day or two ahead. This way you won’t have to worry about making yet one more thing on the day of. So go ahead – make it beforehand. This cranberry relish will keep in the fridge for up to a week. If you happen to be hosting this year, you’re probably already contemplating what kind of menu you want to serve. Are you sticking to your greatest hits list or wanting to try a few new dishes? I personally love to mix a little bit of the old with the new. From there I like to add a few new side dishes I think will pair well with the rest. Last year I had skillet sautéed baby onions and mushrooms, a turkey meat pie, olive oil mashed potatoes and glazed carrots. This year I want to keep the buffet colorful so I will be serving lots and lots of vegetable based dishes. 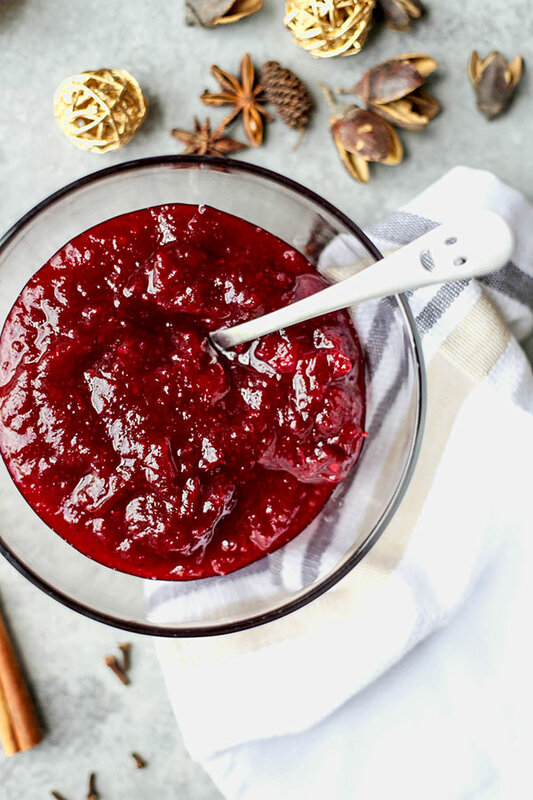 This sweet, tart and easy to make cranberry relish recipe will just go so well with the other items on my Thanksgiving menu. I can’t wait to set it on the table in front of my guests! 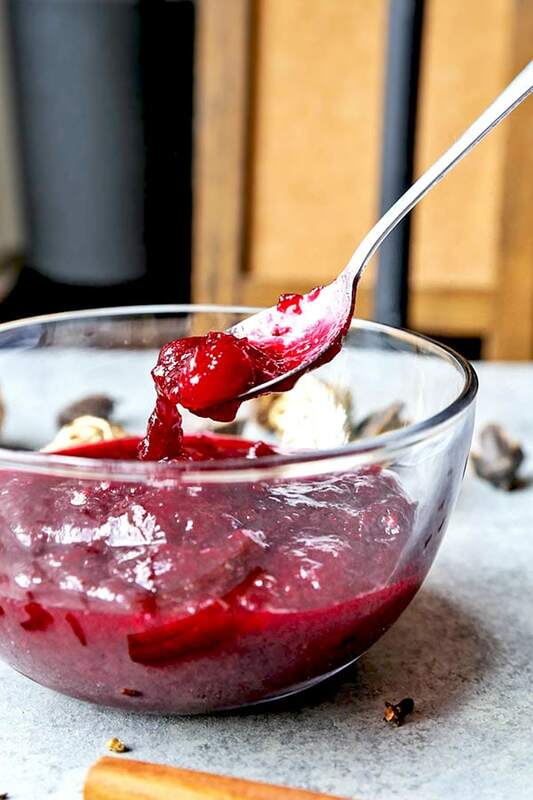 Did you like this Tarter Than Sweet Cranberry Relish Recipe? Are there changes you made that you would like to share? Share your tips and recommendations in the comments section below! Tart, sweet homemade cranberry relish. So much better than store bought! Put all the ingredients in a saucepan and bring to a boil. Lower the heat, cover and simmer for 15 minutes. Turn the heat off, discard the cloves and cinnamon stick. Transfer half of the mixture to a blender and pulse until finely chopped. Return the chopped mixture to the saucepan and stir well. 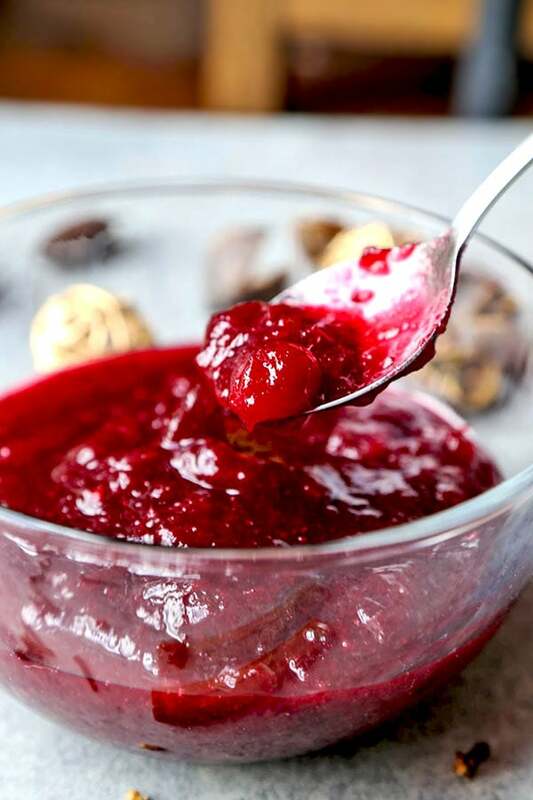 Transfer cranberry relish to a bowl and serve. This cranberry relish will keep in the fridge for up to a week.